Today Wendy’s book is published in United States and Canada……. 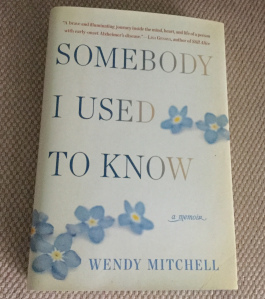 This book is NOT written by me, but by Wendy Mitchell. Her blog can be found at https://whichmeamitoday.wordpress.com/blog/ I was diagnosed with mild dementia a little over a year ago and have begun a journey similar to Wendy’s. I first “met” Wendy on Twitter, discovered her WordPress blog about 6 months ago and have been following since then. I apologize if it seemed like this was my book. The written word isn’t always as clear as I think it is, which is why I’m amending this post. 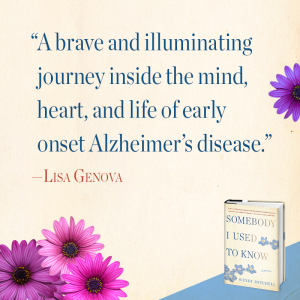 This book offers a unique opportunity both for those diagnosed with Dementia and their families. It’s such a good book, and one I strongly suspect will sit on my nightstand for a long time to come. Who would have thought, 4 years ago, when diagnosed with dementia, that those words would have been typed from my fingertips….? It’s amazing what opportunities can come your way even after the most darkest moment. It’s a land so vast that the ripple effect may not happen as it happened here in our tiny country, Penguin random house has given me that opportunity to find out. Lisa Genova, author of Still Alice kindly reviewed my book there…. Congratulations on your book! Such a sad, scary subject. I wish you well!